The holiday season is swiftly approaching and keeping your glucose under control during this time of year can be an extra challenge when you have diabetes. 1. Keep your meal times consistent. Keeping things consistent is the key. Try to eat about the same time each day. Have at least 4 hours between meals to give your glucose time to return to normal before consuming the next meal. 2. Eat a consistent amount of carbohydrates. By keeping carbohydrate amounts consistent, you can keep your blood glucose levels consistent. As a general guideline, women should aim for 45-55 grams of carbohydrate per meal and men should aim for 60-70 grams per meal. A small snack between meals of about 100 calories and 10-20 carbohydrates may help prevent overeating at meals. And don’t save up your calories or carbs to eat a larger meal later. By skipping meals, you run the risk of hypoglycemia (low blood glucose levels). 4. Keep portion size under control. It is very tempting to overindulge during the holidays. Unfortunately, all those extra calories add up. An extra 500 calories a day will add a pound a week to your weight. Extra carbohydrates can cause your blood glucose levels to soar. If you are dining out, ask for a container at the beginning of the meal and box up half of it before you begin eating or share a dessert with a friend. If you are at a holiday party, choose a smaller plate. Try just a spoonful of a food for variety and limit seconds. 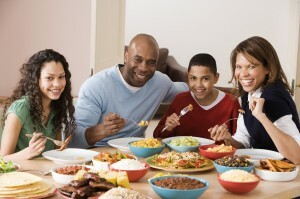 After you have plated your food, move to another room away from food, if possible. 5. Be consistent with exercise. Exercise helps lower you blood glucose. Remaining active during the holiday season will help control your blood glucose and maintain your weight goals. After the Thanksgiving meal is over, go for a walk with family and friends. Aim for 150 minutes of physical activity per week. 6. Stay consistent with monitoring your glucose. The holidays are not the time to take a “diabetes” holiday. Knowing your glucose number is a valuable tool in keeping glucose levels stable. 7. Maintain a consistent schedule for your diabetes medications. Many diabetes medications must be taken at the same time of day or timed with meals. By knowing when to take your diabetes medications and being consistent with taking them, you can keep off the “glucose roller coaster”. If you are not sure when to take your diabetes medications, ask your pharmacist or health care provider. 8. Choose your beverages wisely. Choose low-calorie drinks such as sparkling water, unsweetened tea or diet beverages. Many beverages are loaded with calories and carbohydrates. If you select an alcoholic beverage, limit it to one drink a day for women, two for men, and drink it only with a meal. 9. Try to decrease stress during the holidays. The holiday season can be very overwhelming. Hormones released during stressful situations can raise your blood glucose levels. Talk to your healthcare provider to get help. 10. Live by the “90/10” rule. Ninety percent of the time, try to follow the above guidelines. You then have 10 percent to vary. Out of 21 meals in a week, that leaves you 2 meals with more flexibility. Let your glucose numbers be the guide. If your glucose is greater than 200, it is not the best time to stray from the goals. The “90/10” rule does not apply to medications.